A quick word to accompany the two photographs here in my latest blog entry. Another calm Spring night and a visit to Rainton Meadows nature reserve in Houghton le Spring saw me grab my first 'Mute Swan In Flight' shots, taken on my Canon 7D. 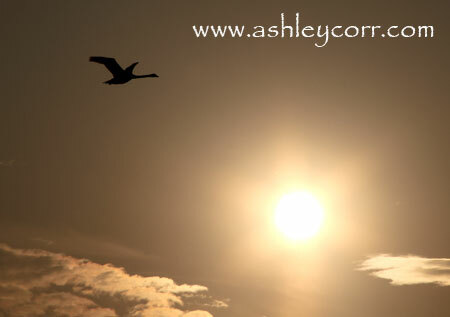 I was lucky enough to have a 300mm telephoto lens attached as this Mute Swan flew by, crossing the sun on it's path. 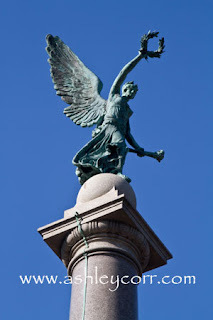 The camera was also set to Quick Burst, allowing seven frames per second, which was just the job for this type of shot. I ran off half a dozen frames as the big bird flew past, then picked the best two depending on the position of its wings, hoping for a nice profile, which I managed to get. I had literally four or five seconds to set the dial with a fast shutter before raising the camera to take a shot. I haven't attempted this type of shot before so I wasn't expecting anything special - mind you, I'm more than happy with the results and I'm already thinking about trying it again, soon. An hour before sunset should be the right time to start shooting, especially as the sun is quite low and gathering more colour as it drops towards the horizon. I particularly like the second shot, that has a feather shaped cloud at the bottom. 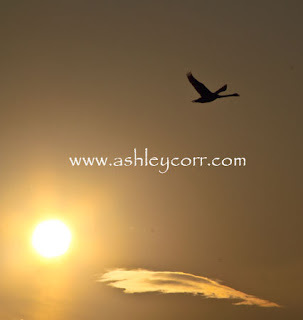 I had been photographing Mute Swans for an hour or so at the same location, but those on the water, not in the air. Infact, you don't often see many Mute Swans in flight at Rainton Meadows so you really need to take your chance when it presents itself. Flights of geese are not uncommon at the meadows, plus ducks and other water birds, including waders. Tonights debut was easier than some, as Swans are slower in flight than most other water birds, so I'll have a bash at the quicker stuff another time. The pond I was photographing at was calm and the weather was fine. I photographed a male Mute Swan as its mate sat on its nest in the reeds nearby. It was a little bit touchy at first, understandably, but as soon as the bread made an appearance it settled down. Aye, they're not daft these buggers! As soon as the bread was gone, so was the Swan! 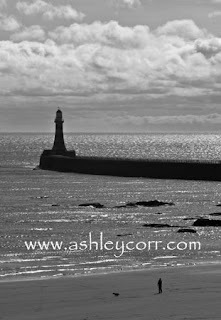 Following my visit to Mowbray Gardens I decided to visit the beach at Roker, Sunderland, while the sun was still shining. The broken clouds caught my eye, so thinking they could add to some decent seascape shots I drove across the Wearmouth Bridge and headed for the water. 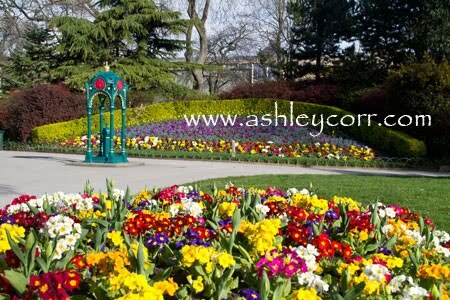 Having done a job in Mowbray Gardens I wondered whether their was similar shots to be had in Roker Park, but a brief stop off proved a waste of time as there was very little colour on show, so it was a case of driving the short distance to the seafront near Roker Hotel. 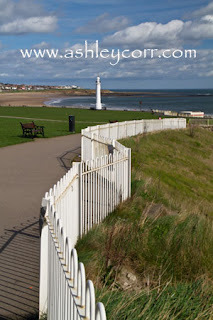 I parked up and took a few steps across the road where my vantage point took in the whole of Roker beach and its well known 'Cat & Dog Steps.' The sands were quite desolate, which was somewhat of a surprise considering the nice weather. There were a fair few walking along the promenade though, towards Seaburn, which lies just along the coastal route, heading north. The tide was low, which wasn't ideal as I'd hoped for some shots with an incoming tide below my vantage point, but I wasn't complaining - I suppose you can only work with what's in front of you! I was tempted to drop down onto the beach itself but decided against it as I was pushed for time. Anyway, the sea was calm so I wasn't missing much, as far as crashing waves are concerned. From experience I've found that good beach shots are amongst the hardest to achieve. Last year I was commissioned by the Tourist Board in Sunderland to supply beach shots of Sunderland, which wasn't an easy proposition. I made a few visits to the Roker/Seaburn beach area and planned where to shoot the best scenes, which were mainly up top, overlooking the sands. It was around this time, October 2010, that I'd captured a few sunrise shots, so it was finally time to grab some daytime shots to go with them. 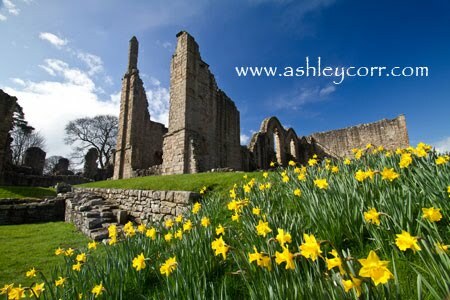 I captured 5 shots which were later reproduced as postcards, which have sold well in Sunderland Tourist Information Centre, as well as further sales in the Winter Gardens and Cafe Bungalow, Roker. Examples of the cards can be found here - Postcards > ashley Corr.com. My latest beach shots, shown here, aren't commissioned work, although I do plan to reproduce one as a new postcard which will increase the set to 20. Beach shots are in demand, so I plan to test myself further in the coming weeks to add better shots to my portfolio. A good sky is a must have - get that and you're well on your way! Both beaches in Sunderland (Roker & Seaburn) are very clean and relatively tidy - unlike the beaches further south at Seaham and Easington, where decades of coal mining are still evident on their sands. The seaside area of Sunderland is buoyant during the Summer months, as expected. 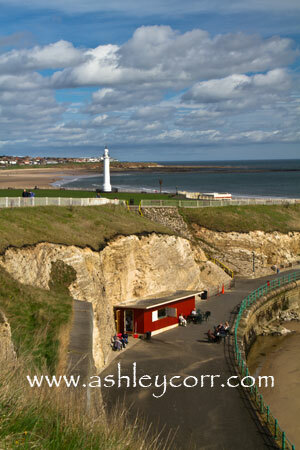 The usual run of pubs, restaurants and amusements lie along the promenade, especially at Seaburn, the central area of Sunderland's coastline. Seaburn's Marriot hotel is a popular resting place. Overlooking the North Sea, its easterly facing rooms give perfect views of the sea which often crashes off the nearby walls during the winter months. I remember one day last year when I was fortunate enough to witness the waves in full force, keeping a sensible distance from them and avoiding a soaking, as I took a few photographs. A gang of kids were dodging the waves as they crashed against the wall, but not one of them evaded a soaking. Quite funny at the time! Once again, thanks for visiting. I'll be back shortly with my latest work - Ripon, North Yorkshire...more of those Mute Swans... Historic Durham...and more. 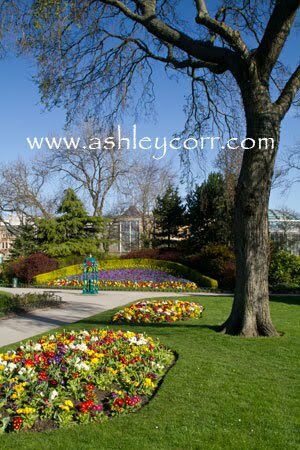 A couple of weeks ago I visited Mowbray Gardens in Sunderland City Centre. My last visit was at least two years ago, as I remember taking a few photographs for a calendar I was contributing to at the time. During the Spring and Summer months the well maintained gardens are bouncing with colour, so the visitor count rises considerably during this time. The weather was fine so I had the perfect opportunity to get the shots I wanted. 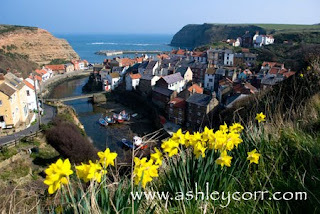 Many thanks to everyone who has visited my website. The hit counter has increased dramatically this year, even as recently as January when it was approaching 40,000. 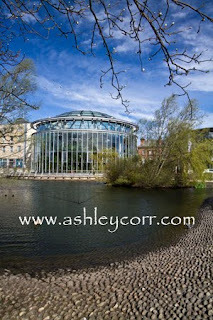 Since then, almost three months ago, ashleycorr.com has had a further 5,000 hits and counting. I aim to fulfil my promise of regular updates, not just in image form but in blog posts, which I enjoy adding each week. Already in 2011, ashleycorr.com has had 43 updates and that number will continue to rise throughout the rest of the year. Thanks also to everyone who has purchased my work in it's various formats, not only through my site but also the local outlets where it is currently available. New ideas are in the pipeline and more details will be released soon, so be sure to revisit my blog for full details. More photographs to come shortly. Thanks again. I wish I was given a fiver for each time I've visited the Copt Hill Barrow, known locally as the Seven Sisters. Only six trees are standing these days, plus a sapling, which brings the total back to seven after one tree was burnt down. The sapling is always vunerable to vandals although no-one has had a go at it to date (touch wood - no pun intended). As regular visitors to my blog will be aware, the Seven Sisters is situated in my home town of Houghton le Spring and it is literally five minutes drive from my house, so I often make visits outside of the Summer season. The reason I miss out Summer is simply for photographic reasons - nothing else. The Sisters are much more photogenic when they've shed their leaves so I'm a regular visitor during Spring and Winter when I can grab some nice silhouette shots. As you can imagine, I've made countless visits to this place down the years and the resulting images are always different. Here are two recent examples that perfectly illustrate the changing mood that the weather can bring. The first shot was taken in mid-March, on a cold foggy morning. 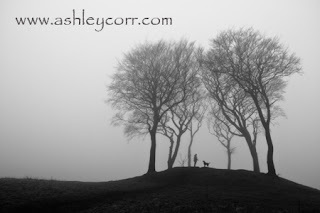 I hadn't photographed the Seven Sisters in fog before so it was time to put that right by making a visit, with visibility being very low as I drove up to the Copt Hill Public House car park. I met a dog walker as I was in position taking my first shots near the path that leads you to the barrow from the top of the field. 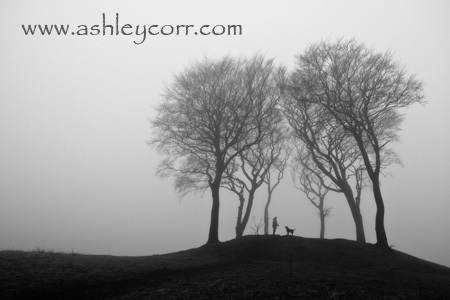 As she was heading over the barrow with her dog she kindly offered to pose for a short while as I took more shots. A big THANK YOU to Sue and Henry for making the first shot (above) possible. I love it - captured the moment nicely! The second, and more recent shot, was taken just before sunset as we entered the last few days of March. I had been out somewhere in the car and was heading home along the A690 when I noticed how low the sun was, and also how full and orangey it appeared. Normally, just before sunset, the sun is so bright that the glow around it is blown out and it's shape isn't visible. Today there was almost no surrounding glow, just a perfectly round deep orange sun, on it's way down and quickly approaching the skyline. 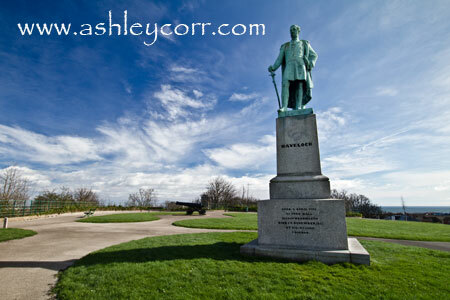 As I had my camera bag with me I made a quick diversion and drove up to the location once again. A quick dash from the car to the barrow gave me enough time to take half a dozen quick shots before the sun had set. I just made it in time. There were no dog walkers about today though - just as well as it must have looked odd seeing a grown bloke legging it over the field with a large back-pack bouncing up and down. Oh dear! Anyway, no tripod involved in these two shots - both were handheld. 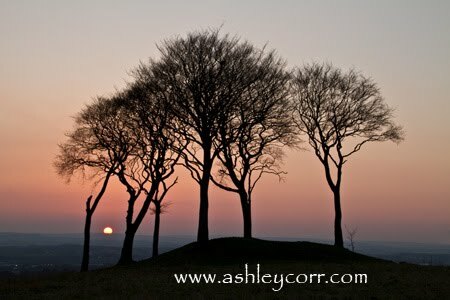 I'll be uploading them to my website very soon, on a page dedicated to the Copt Hill Barrow (Seven Sisters), that's if there's any room left on the page! 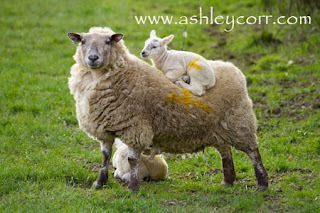 Next up - I'll be blogging again with some accompanying Springtime shots. Now and again I find myself photographing scenes that contain water, whether it be a seascape, a river scene or simply a waterfall, which are very few and far between in my neck of the woods. Waterfalls in the north-east of England are usually confined to an area approxiametely 35 miles from my home, in a place called Middleton in Teesdale. There's a few dotted about in this region - High Force is the best known, followed by Low Force and Cauldron Snout. On the approach road to High Force, the B6277, look out for the signpost 'Bowlees Visitor Centre, which is tucked away behind trees off the road. A short drive leads you to the car park which offers free parking all day. From here, follow the signpost that leads you to the wooded area where you'll find 'Gibsons Cave', a waterfall at the end of the route. The woodland path ends at Gibsons Cave but there's no fence stopping you from getting nearer to the falls so I took advantage and stepped over the rocks to find a decent position to shoot from. A couple of test shots later and I'd found myself a decent spot. Three legs down and the camera was then perched and primed. 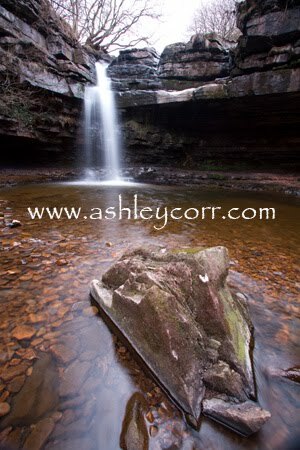 My first shot (shown here) was taken en route as I walked through the woods towards the cave. It's a simple waterfall, with a drop of around 10 feet, and it's a taster of what's to come further up the path. I've visited Gibson's Cave on two previous occasions, the last being a couple of years ago around the same time of year. Depending on recent rainfall you'll see the main waterfall in different moods. As I reached the cave it was immediately obvious that the flow of water from the top wasn't as forceful as the last time I was here. There was plenty of water cascading at the top, before dropping below on the fairly still waters, but it definately wasn't as dramatic as before when it was in full flow after a heavy rainfall. 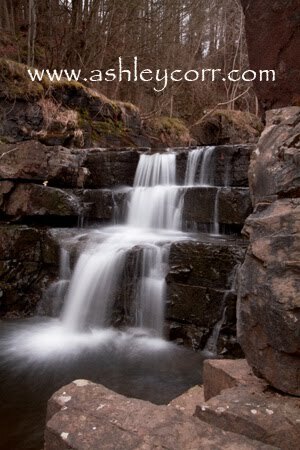 Nevertheless these waterfalls always make for good photographs if you know your slow shutter speeds. A one second shutter gave me these two shots, together with a very small aperture to give max depth of field (that's front to back sharpness). I had me wellies on, so getting me feet wet wasn't a problem, just the slippery rocks I had to negotiate on my way into position. I was the only person at the site during the 30 minutes I was photographing, which was fine by me. From there I was back into the car and making my way back to Houghton, listening to the Wales versus England football match as I drove.